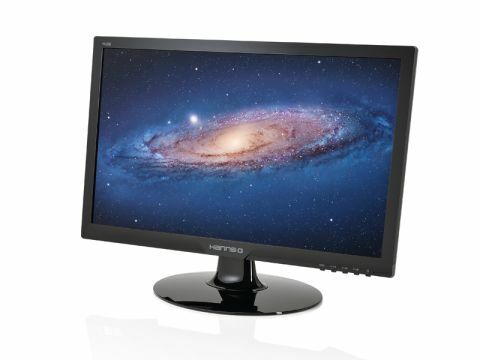 The Hanns G HL229DPB monitor has a 21.5-inch screen with a 1920 x 1080 resolution and a 1,000:1 contrast ratio, all for the very wallet-friendly price of £89. But is it too good to be true? As you might expect from an LED monitor, the HL229DPB's weight is pretty light, even by flatscreen standards. However, we were disappointed to see that for all its LED splendour, it's not much thinner than a standard LCD monitor, with a thickness of 48mm. Less surprising is the lack of a HDMI port. The DVI input is HDCP compliant, which means if you've got a Blu-ray drive in your Mac you can use a HDMI-to-DVI cable to view Blu-rays on this monitor. The buttons aren't ghastly to use, but not as pleasant as the touch sensitive icons found on other screens. It's not as good looking as Apple's own monitors, but it is a lot less expensive. Of course, the most important question is how good is the image quality? Pretty good, as it happens. Throughout our tests colours were reproduced well, with gradients running smoothly, rather than the blocky juxtapositions of colours displayed by some cheap monitors. As you'd expect from an LED monitor, contrasts between light and dark colours were very good. Text was impressive, even with small fonts. Viewing angles were also good.